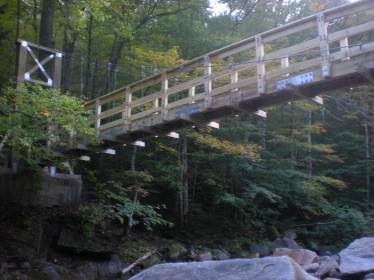 In 2010, the Town of Mount Tabor, Vermont, located in the Green Mountain National Forest, authorized the replacement of the Big Branch Suspension Bridge which crosses over the Big Branch River. 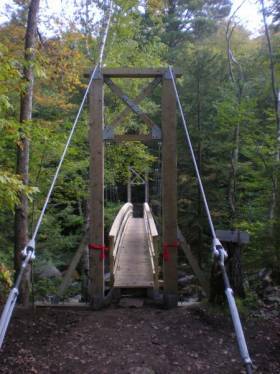 The suspension bridge is located in the National Forest System land in Rutland County, Vermont on the Manchester Ranger District of the Green Mountain National Forest. The big Branch Bridge itself is part of the National Scenic Trail and Long National Recreation Trail System. The existing steel and timber suspension bridge, which has a 100 foot span, had reached the end of its useful life. The bridge was originally constructed in 1962 to cross over the Big Branch River prior to Wilderness designation. Congress designated the Big Branch area as Wilderness in 1984 and was expanded in 2006. This included the area where the bridge was to be replaced. The original bridge had deteriorated so extensively that when Portland Bolt received a purchase order from the contractor in March of 2010 to manufacture the bolt requirements for this bridge, it was obvious that the fasteners were needed in a hurry. The fastener requirement for the Big Branch Bridge replacement met a variety of configurations including hex bolts, hex lag screws, fully-thread rods, and clevis tie-rod assemblies. Although these types of bolts are everyday products for Portland Bolt, there were two distinct requirements that made our company stand out from the rest. First, all of the bolts and fasteners needed to be hot-dip galvanized, which we do in-house at our facility in Portland, Oregon. Second, all of the fasteners needed were to be 100% melted and manufactured in the United States of America. This meant that all of the hex bolts and all of the hex lag screws would need to be hot forged in our facility from scratch. This requirement was a large reason why the contractor constructing the bridge came to us, since domestically manufactured lag screws are not available in the marketplace, and the fact that we have no problem manufacturing this part sets us apart from most other bolt suppliers.